Your little slugger just hit a double off the pitcher, scoring his teammate from 1st base and winning the playoffs. 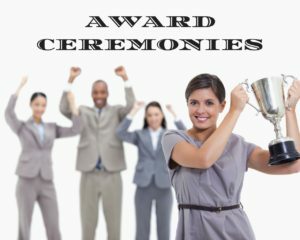 YOU are the parent in charge of the Awards and Recognition Celebration…..what now? One of the biggest challenges facing any Manager, Coach, Business Owner or Organization today, is keeping up morale. Getting people together for a Recognition Ceremony, presenting awards and enjoying each others company in a relaxed environment is a tough assignment these days. Work and school schedules will need to be coordinated, food catered or prepared, trophies bought or certificates printed are just a small part of the effort needed for a successful event. All of this before you even realize you need somewhere to actually stage the celebration. You could book the place with the Rodent who hawks pizza. Maybe the local McDonalds has enough tables for the team. Another option is to clean your house top to bottom, lock the dog outside and then invite a bunch of little leaguers, parents, and friends over to celebrate. What? None of these options sound terribly appealing? 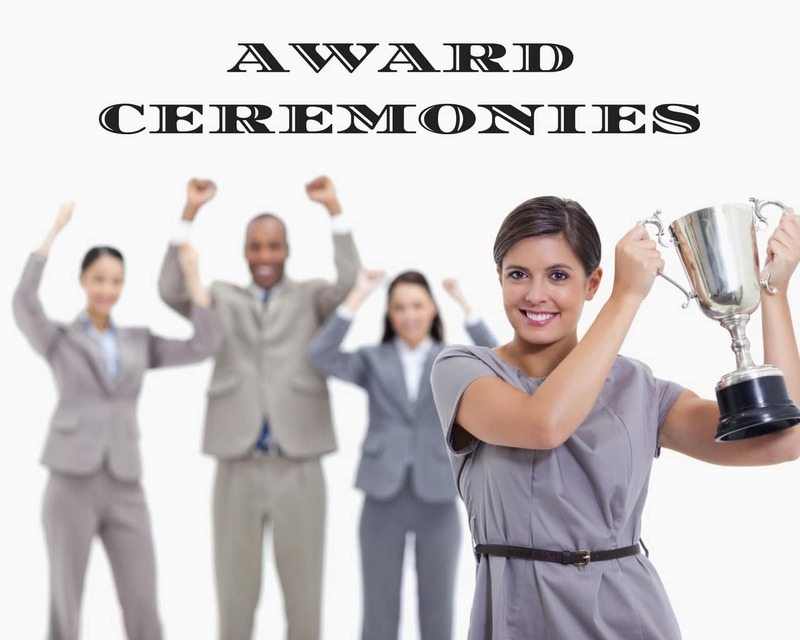 What other options are there for holding an Awards Ceremony or Recognition event? Imagine for a moment that you are the HR Manager for a small company. The Owner is concerned about employee morale and has tasked you with working to improve things around the office. You just had a record-breaking sales month. A celebration seems like a terrific way to say thanks and recognize your hardworking employees. Just one little thing stands in the way of doing just that, space. In your office, you have resorted to storing office supplies under a bathroom cabinet. You enclosed a urinal in a tall cabinet. Just so you can store extra toilet paper and a dustpan. Since you have 20 employees, just getting them all in the office at one time is difficult. How are you going to arrange an event to say thanks for all their efforts? It happened, it actually happened, “why in the world did I run for the HOA Board?” you suddenly think to yourself. Not only did you throw your hat in the ring, you were actually elected President of the Board. In addition, the Board Secretary will soon come to you and explain you can no longer hold Board Meetings at the library. You have a small HOA and raising dues is HUGELY unpopular. Booking a hotel meeting room or space at a restaurant where they will expect you to not only pay but order food and drinks also, is unthinkable. Are there any easy options? Have you ever found yourself in one of these types of situations? Have you ever needed to get a group of people together in one place to celebrate, and recognize their achievements? Many of you have, including us here at The Beacon Center, that is part of the reason we opened our venue. We know what it takes to put on a show. Let us help you show your employee or little sluggers that you appreciate everything they do. Vist our website or give us a call at 702-528-0477 so we can help you get to work planning a memorable event. Social Media has greatly reduced the distribution of content in our readers’ newsfeeds and is instead promoting their own paid sources. When you share with your friends, however, you greatly help distribute our content. Please take a moment and consider sharing this article with your friends and family. Thank you. The Beacon Center is the collaborative effort of Husband and Wife team, Gil & Becky Stonebarger.Becky is the mastermind and driving force behind the Center, with Gil supporting her every step of the way. With over 50 yrs of combined experience in Hospitality, Becky & Gil finally realized their dream of an affordable, inspiring space for Businesses and Individuals alike to meet, train or just party.Becky has owned several businesses through the years and is very proud of her degree in Casino Management and is currently working on her Event Planning degree as well. Gil is a US Navy Veteran who has managed hospitality operations across the country for over 30 yrs. They have been happily married for over 30 yrs, have two daughters and two grandchildren. Fundraising As a Marketing Tool, Is it OK? Is Your Business Pennywise and Pound Foolish? Adding Value or Adding Problems? Becky Stonebarger on Baby Showers – An Investment in the Future? Cedar on Baby Showers – An Investment in the Future? © 2019 The Beacon Center.